1.In a sauce pan, bring 1 tablespoon of water to simmer over medium-low heat. Whisk in 1 piece of butter. When butter had melted, add another piece. Continue with remaining butter pieces, one at a time. Make sure the mixture does NOT come to a boil, otherwise the butter will separate. 2.Keeping the heat on medium-low, add the lobster pieces and cook for 5 minutes, turning the lobster pieces every minute or so. Make sure mixture does not boil. Remove lobster pieces and divide amongst the 2 serving bowls. 3.In the same saucepan with the remaining butter, turn the heat up just a bit, add the garlic. When fragrant, add the tomatoes and cook for just a couple of minutes until the tomatoes have released some of the juices. I like to gently smash the tomatoes a bit so more juice comes out. Throw in the basil and you’re done. 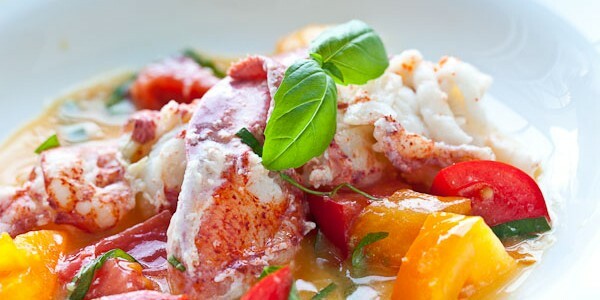 Spoon tomatoes over lobster and serve immediately.